It’s the end of National Ice Cream Month, and I am still on a homemade-ice-cream-for-all kick. No ice cream machine? No problem! This ice cream really did require a lot of patience, though. First I had to make dulce de leche. Then I had to make a fudge sauce. THEN I had to make a fluffy ice cream batter and let it freeze for 6 hours before dishing it up! But…any ice cream that fuses salted caramel, fudge, and chocolate chips is going to be totally worth it. I tend to resist buying things if there is the slightest chance I could make them at home. Things that are delicious and definitely need to be a part of my life. Things like dulce de leche. But then, often, I get scared or distracted, and before I know it two years have passed and I still haven’t made my own dulce de leche! And, of course, buying a jar of it in the grocery store would just be cheating. So whole years have passed that did not include drizzling dulce de leche on my ice creams and cakes and scones…and eating it by the spoonful. What on earth was I thinking!? A few weeks ago, Sarah told me that she had a dill plant that was threatening to take over the world, and asked if we could possibly put it to good use? I must admit that I’ve never really liked dill. (I think I have admitted that before.) It just reminds me of pickles, which I hate. But this is what Sarah and I are all about: trying new things, and re-trying old things, and generally just eating awesome foods. Plus, I love that she and I are both trying to grow a food garden this summer! I am all in favor of eating what we grow! And the world stopped spinning for just a second. If you’ve been hanging around here for a while, you might know that my mom has a lot of food intolerances. We don’t get to share as many meals as I would like now that we live in different cities, but I am always looking for recipes and treats to share with her! Ice cream has been kind of a doozy. When I was in high school, my mom and I used to have “Girls Weekend” regularly—basically two days packed full of shopping, Taco Bell (don’t judge me), chick flicks, and enormous amounts of ice cream. We still talk about doing that, but there are so many roadblocks! I have a toddler; she can’t eat ice cream. The capstone of the whole weekend, staying up late and eating ice cream until we make ourselves sick, has taken on a whole new meaning for her. I know there are tons of vegan (and therefore dairy-free) ice cream recipes in the world, but since I hate bananas (and all fruits), I have mentally rejected about two-thirds of them out of the gate. I resolved to turn the custard into ice cream right away. Yum! Summersummersummersummersummersummersummersummersummersummersummersummer, tomAto, tomAto! COOOOOOOORN, COOOOOOORN. Anyway. Make some quiche! Quiche is great food! If you skip the crust, then this meal comes together super quickly (and is more of a frittata than a quiche…just saying). If you don’t skip the crust, you may find yourself grumbling under your breath because the crust shrank weirdly when you par-baked it, despite your use of pie weights. No? Just me, again? But it will all turn out lovely and delicious and tasting of summer! As we got to know each other better, he totally held up his end of that analogy (though I quickly moved on to other things once I really started baking in earnest). No matter how many strawberries I brought him, he would generally finish them all in a single sitting. So…imagine my complete surprise when, last year, he revealed that he likes nectarines better than strawberries. That he always has! Now, when we go to the farmer’s market, one of the first things he does is fill a bag with nectarines so he can eat them while I am picking out greens and beans and squashes. 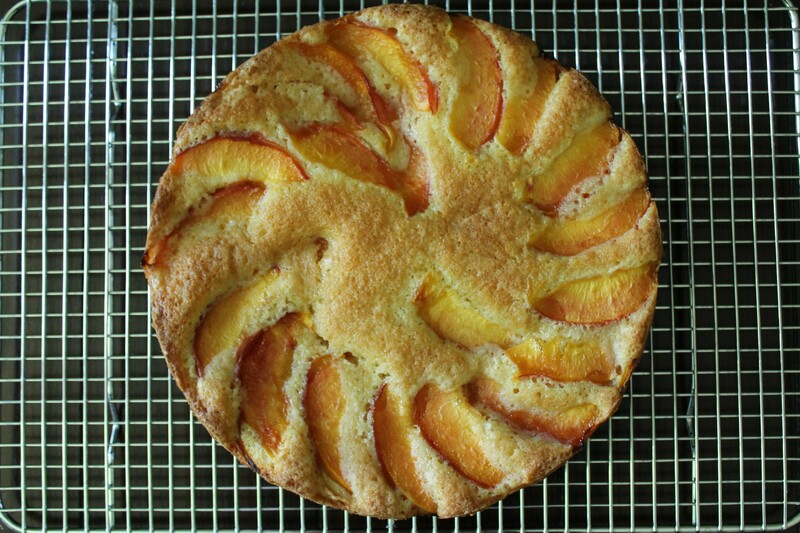 This week I stole a few of the straggling nectarines and baked them into a cake. This cake is so simple and homey. The nectarine flavor is mild, and the cake is not too sweet. It makes a lovely accompaniment to afternoon tea or coffee, and a great end to a delicious lunch! A while back, I mentioned that I am growing acorn squash this year! I have a little container vegetable garden on my porch, and almost everything I am growing is thriving. Immediately after harvesting my first bunch of blossoms, the plants started yellowing. I am not an experienced gardener, people. I was at a loss. Eventually I found that one of the vines was being eaten from within by a worm—and there went one of my two baby acorn squash (augh!). I still can’t figure out what’s wrong with the others. So. Believe me when I tell you that these quesadillas were a labor of love. With these, I used up the last blossoms my poor, sad acorn squash seem like they are going to produce. What a tasty way to go out! But since then, I have discovered a love for both Indian food and lentils (perfect storm!). And the more people I share that sad dal story with, the more suggestions I receive for wonderful dal variations to try—as well as a few scoldings for my low opinion of dal in the first place. And to answer your next question, although this dal was delicious, my toddler spit out his first bite (though he did try two more bites after that!—they met the same fate). Oh well. Dal is a great dish because it is inexpensive* and filling! In this dish, black beluga lentils swim in an aromatic, spicy, creamy tomato sauce. Serve with basmati rice or your favorite Indian flatbread and you’ve got a completely nutritious meal! I have been on an open-face sandwich kick lately. Simple lunches really are a pleasure, aren’t they? And now, at the beginning of tomato season, what could be a better way to enjoy that pungent, bursting flavor than fresh on a slice of warm, toasty bread? I have found the perfect ice cream recipe. I mean seriously. Hang up your hat, make yourself at home, look no further, this is the best ice cream in the world. Just in time for National Ice Cream Month! It has only 3 ingredients. It requires almost no measuring. It takes 5 minutes to prepare. Skill level: easier than easy. No tempering! No straining! No finicking of any kind! The end result is creamy, cold, and just soft enough to scoop straight out of the freezer.